It’s good to mix things up every now and then. I think this will be my go to salad though. Love it! This is my house salad, however, only in the summer when we have Jersey tomatoes. Caesar is my winter “go to” salad or my daily arugula w/ lemon. 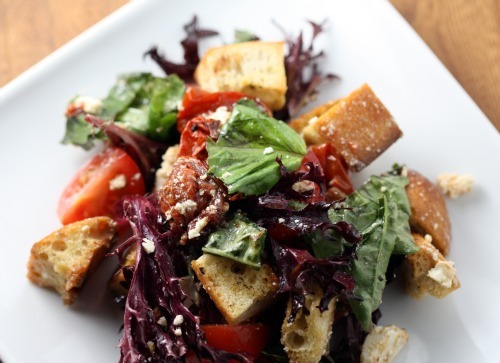 Now I am craving a panzanella, as well as summer! I used the Barefoot Contessa winter tomato technique all the time, it’s great! For some reason I use it just in pasta dishes, but your post makes me realize I need to branch out to salads. 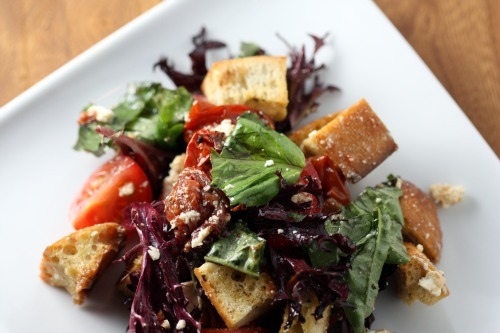 Who knew panzanella could be possible in winter! Salad is an every night event, and I concur on the ratio…we use a lot of vinegar and lemon and a smidge of oil. I am going on the hunt for Burrata, I’m always wanting to change it up! Yum! I can imagine how good this salad was with burrata. I have trouble finding good burrata where I am too. i love a great salad, but absolutely dread a boring one. This looks great, and I’ll keep it on file for the next time I’m wanting for some green leaves. My mom spent most of my life serving me seriously boring salads. Which I then rebelled against by hating salads for a very long time. Now I’m back in the loving salad camp again…so long as they are interesting. And this one? I find it compellingly fascinating. I’m not much of a tomato fan, but I definitely prefer them cooked. 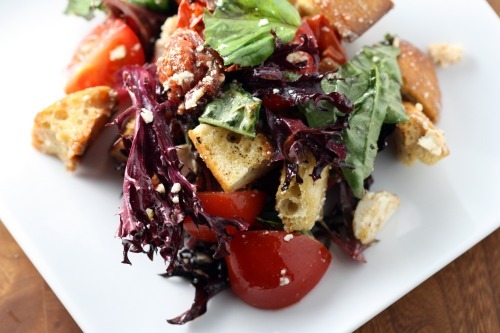 I love the bits of bread in this salad. Isn’t it the best bit? Thanks very much for the recipe. I must have been a rabbit in a previous life because I eat salads all the time; anything goes but always the dressing has olive oil and garlic and lemon juice. This looks lovely and I’m all over salads right now after just discovering and making a glorious one from the Moosewood Cookbook – tofu and peanut dressing and wowness.Giant breadcrumbs or croutons in salads is one of my all time faves though. Bookmarked! Have you checked PFI https://www.pacificfoodimporters.com/ for Burrata? This salad looks great, I’m sure my husband would love it if I strayed from our house salad of spinach, apples, walnuts and blue cheese! I love a good salad. And they can get boring and bland pretty quick. This looks like something I would get at a restaurant. It looks fresh and so professional. Mmm, mmm mmm! The Whole Foods at Interbay has burrata!